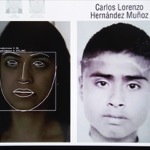 Rafael Lozano-Hemmer - Project "Level of Confidence"
Para información en Español, favor de descargar este documento en PDF. 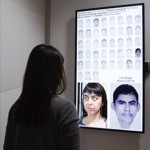 "Level of Confidence" is an art project to commemorate the mass kidnapping of 43 students from the Ayotzinapa normalista school in Iguala, Guerrero, Mexico. It was released on March 26, 2015, exactly six months after the kidnapping took place. The project consists of a face-recognition camera that has been trained to tirelessly look for the faces of the disappeared students. As you stand in front of the camera, the system uses algorithms to find which student's facial features look most like yours and gives a "level of confidence" on how accurate the match is, in percent. The biometric surveillance algorithms used, -Eigen, Fisher and LBPH-, are typically used by military and police forces to look for suspicious individuals whereas in this project they are used to search for victims instead. 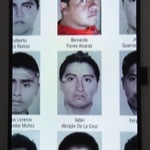 The piece will always fail to make a positive match, as we know that the students were likely murdered and burnt in a massacre where government, police forces and drug cartels were involved, but the commemorative side of the project is the relentless search for the students and the overlap of their image with the public's own facial features. The project software is available for free download so that any university, cultural centre, gallery or museum can set-up the piece and exhibit it. To show the work the institution must download the project software and provide a computer, screen and webcam. The full instructions and specifications are in this PDF document. The project also exists as an open source software, which can be modified by any programmer with knowledge of OpenFrameworks so that he or she can make their own version, with different content. An example may be someone who trains the algorithms with images from missing aboriginal women in Canada. To download the source code please visit our GitHub. On the launch of the "Level of Confidence" project, already the piece is planned to be exhibited at the MUAC Museum in Mexico City and at Universities across Mexico like Iberoamericana, UAM, Universidad de las Artes, Universidad Autónoma de Aguascalientes and others. Internationally the piece is being shown at Lozano-Hemmer's exhibition at Art Bärtschi Gallery in Geneva, by the FOFA Gallery at Concordia University in Montréal and by the Universidad Nacional de Tierra del Fuego in Argentina. We shall update this page as more exhibitors show the work. The piece can be acquired for art collections, but all proceeds are directed to a fund to help the affected community, for example in scholarships for new students at the normalista school. The work is editioned with 12 copies and one AP, includes all the equipment, installation and a certificate of authenticity. It can be acquired through any of Lozano-Hemmer's galleries. Keywords: indoor, database, tracker, biometric. Level of Confidence, Hirshhorn Museum and Sculpture Garden, Washington, D.C., United States, 2019. Faces, Es Baluard - Museum of Modern and Contemporary Art, Mallorca, Spain, 2019. La No Comunidad, CentroCentro, Madrid, Spain, 2018. Global Positioning System Not Working, Akademie der Künste der Welt, Cologne, Germany, 2018. Printemps Numérique X 5 à 9 au McCord, McCord Museum, Montréal, Québec, Canada, 2018. Reality Machines - An Art Exhibition on Post-Truth, CRASSH, Cambridge, Massachusetts, United States, 2018. Authenticate, Cypress College Art Gallery, Cypress, California, United States, 2018. Digital Dynamics 2018: Interaction, The Museum, Kitchener, Ontario, Canada, 2018. Nivel de Confianza, XLIV Festival International Cervantino, Guanajuato, México, 2017. The Rise of Bio-Society, Riddoch Art Gallery, Mount Gambier, Australia, 2017. Nothing to Hide? Art, Surveillance, and Privacy, Real Art Ways, Hartford, Connecticut, United States, 2017. Looking at One Thing and Thinking of Something Else - Part Three: United We Stand, Carroll / Fletcher Gallery, London, United Kingdom, 2017. Nivel de Confianza, Post-Screen Festival, Lisbon, Portugal, 2016 - 2017. 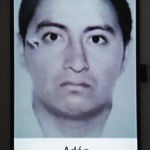 De Muerte Presente - Der Tod in der mexikanischen Gegenwartskunst, Kunstmuseum Heidenheim, Heidenheim, Germany, 2016 - 2017. Robots Building Robots, Hedreen Gallery, Seattle, Washington, United States, 2016. Lo que nos Falta. Imágenes desde la Ausencia, Museo de la Ciudad de Querétaro, Galerí­a Libertad, Querétaro, México, 2016. VI Bienal de Arte Contemporáneo, Fundación Once, Madrid, Spain, 2016. Eco Expanded City / Synthetic Nature, WRO Art Center, Wrocław, Poland, 2016. GIEI Ayotzinapa, Universidad del Claustro de Sor Juana, Mexico City, México, 2016. Remote Signals, ARSi maja, Tallinn, Estonia, 2016. FAVCA-XIII Festival de las Artes Visuales de Campeche, TBA, Ciudad del Carmen, México, 2016. Art-Facto-Today, Eastern Bloc, Montréal, Québec, Canada, 2016. I'll Be Your Mirror: Interactive Reflections, Telfair Museums, Savannah, Georgia, United States, 2016. Nivel de Confianza, Gund Gallery, Gambier, Ohio, United States, 2016. Nivel de Confianza, Pinta Miami, Aluna Art Foundation, Miami, Florida, United States, 2015. The Age of Catastrophe, Actual Contemporary, Winnipeg, Manitoba, Canada, 2015. Nivel de Confianza, La Cigarra, Chiapas, México, 2015. Performing Likeness, Fort Worth Contemporary Arts, Fort Worth, Texas, United States, 2015. ISMAR, City Museum, Fukuoka, Japan, 2015. 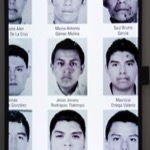 Carteles por Ayotzinapa: Primer Bienal Internacional de Carteles Oaxaca, OPC - Oficina de Proyectos Culturales, Puerto Vallarta, México, 2015. Nivel de Confianza, Benemérita Universidad Autónoma de Puebla, Facultades de Ingenierí­a, Medicina y Filosofí­a y Letras, Puebla, México, 2015. El Estado de las Cosas, FotoMuseo Cuatro Caminos, Mexico City, México, 2015 - 2016. ANT, Galería Punto, Valencia, Spain, 2015. Meta, Narrativas Digitales, Galería Andrea Pozzo - Universidad Iberoamericana, Mexico City, México, 2015. Level of Confidence, Baltan Laboratories, Eindhoven, Netherlands, 2015. Memory Burn, bitforms gallery, New York City, New York, United States, 2015. Nivel de Confianza, Ciudad Juárez, México, 2015. Art and Conflict Symposium, Wolfson College, University of Oxford, Oxford, United Kingdom, 2015. Eurocaravana 43, Juicebrothers No2, Vienna, Austria, 2015. Nivel de Confianza, The Neon Rex Project, Mexico City, México, 2015. Nivel de Confianza, Museo Universitario Arte Contemporáneo, Mexico City, México, 2015. Nivel de Confianza, Centro Nacional de las Artes CENART- Galería de Arte Electrónico Manuel Felguérez, Mexico City, México, 2015. Level of Confidence, FOFA Gallery, Montréal, Québec, Canada, 2015.